In January, at Washington D.C.’s Transforming Transportation, representatives from ten global cities gathered to share how they are fighting the unacceptable level of traffic deaths in their cities. While they may differ in many ways, the cities share a common goal: to make their streets safer for all people. Each of the ten cities are part of the Bloomberg Philanthropies Initiative for Global Road Safety: Bangkok (Thailand), Ho Chi Minh City (Vietnam), Shanghai (China), Accra (Ghana), Addis Ababa (Ethiopia), Bandung (Indonesia), Bogotá (Colombia), Mumbai (India), São Paulo and Fortaleza (both in Brazil). 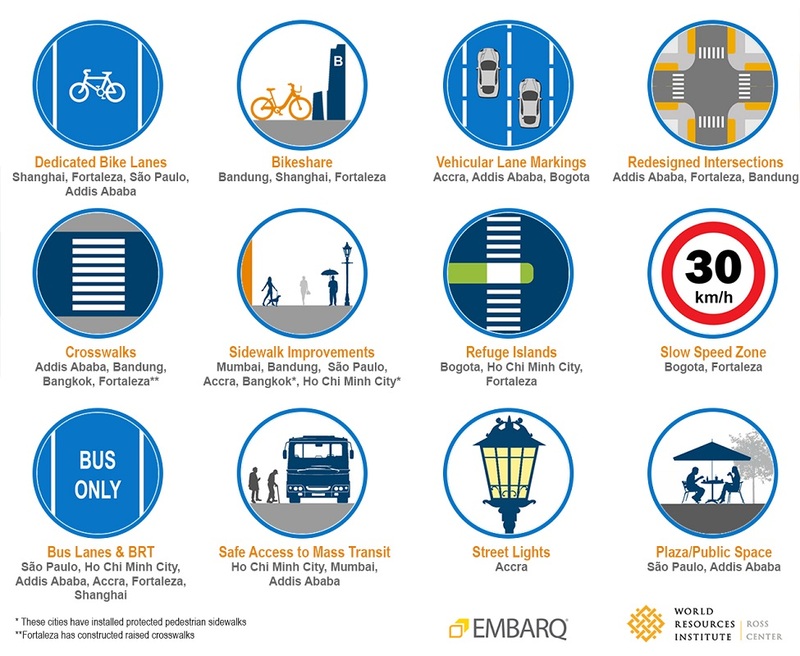 As part of the program, partners from WRI, Vital Strategies, National Association of City Transportation Officials (NACTO) and the World Bank are supporting these cities to heighten safety through improved street design and mobility. Many urban streets have been designed to cater to cars moving at high speeds. The result is a lack of safe spaces for walking and bicycling, with high levels of traffic deaths and air pollution from vehicle emissions. Therefore, all ten cities are trying to shift their design strategies from “vehicle-oriented” to “people-oriented.” This type of approach is based on the philosophy that cities have a responsibility to provide a high quality of life for their residents. At the core of this approach is providing safe spaces for everyone to travel, whether they are driving, cycling, walking or taking public transport. Each city has been conducting road safety audits and implementing design improvements for streets and intersections. Lowering speed limits to 40km/h(25 mph), along with adopting safer street design like narrower vehicle lanes, can have an immediate impact on safety. Furthermore, reducing speeds can also ease congestion by reducing bottlenecks. In São Paulo, the speed limits have been reduced from 70 to 50 km/h (43 to 31 mph) for over 300 km (186 miles) of major roads. Furthermore, the city has piloted low-speed zones of 30km/h (18.6 mph) in select high-risk areas. As a result, traffic deaths in the city have dropped by 21 percent. Fortaleza has also made necessary policy changes to incorporate low-speed zones within the city. Almost all city trips involve some amount of walking, so safe pedestrian infrastructure should form the basis of all urban street networks. To address this, Mumbai has turned its attention to a lack of safe sidewalks and the need for safer access to public transport. The city selected 9.5 km (5.9 miles) of street to pilot the sidewalk safety interventions. This includes building a 1.8 meter (6 foot)-wide sidewalk as well as space for bus stops, taxi and rickshaw stands and street vendors. 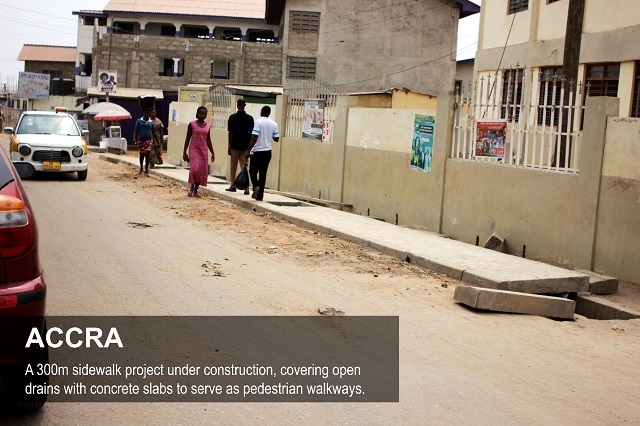 Accra has been adding sidewalks to streets that were previously without them. 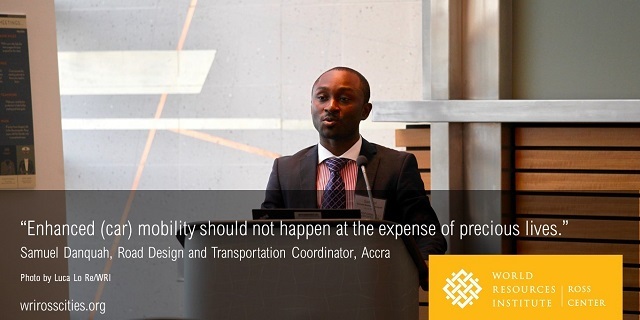 “Through the intervention of the initiative, we see vehicles moved off of footpaths, and people are now able to walk safely,” said Samuel Danquah of Accra (pictured above). In Bangkok, a busy pedestrian market area now prioritizes safer walking by removing one lane of vehicle traffic to increase pedestrian space in the peak evening hours. Furthermore, temporary barriers are used to further protect pedestrians. Beyond sidewalks, there are many proven measures to improve pedestrian safety. “We are not reinventing the wheel… it’s about extending the curb, raising pedestrian crossings, improving the intersections and basically giving more space to people,” explained Hannah Machado, Coordinator of Road Design and Transportation for São Paulo. Providing safe routes for cyclists increases transport options and contributes to increased road safety through its traffic calming impact. Shanghai has plans underway to build 2000 km (1240 miles) of non-motorized transport infrastructure in the form of bike lanes and pedestrian corridors. Additionally, Bandung has started a bikeshare program, as has Fortaleza. These bikeshare programs are anticipated to increase the number of people using non-motorized transport, as similar programs have in many other cities. 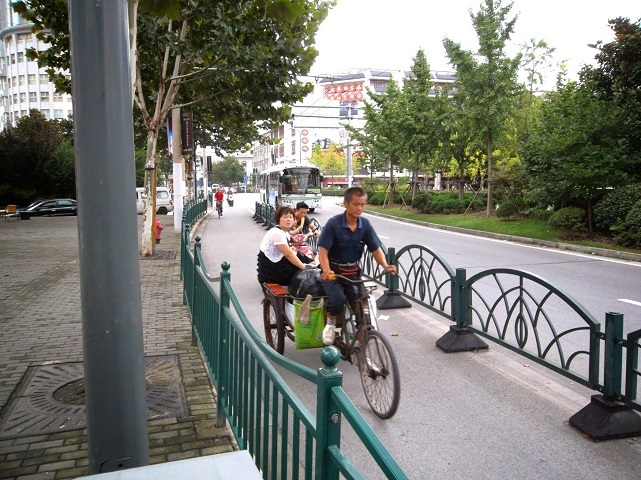 Shanghai and Fortaleza are both planning to scale up their bike lanes to form interconnected bike networks throughout the city. 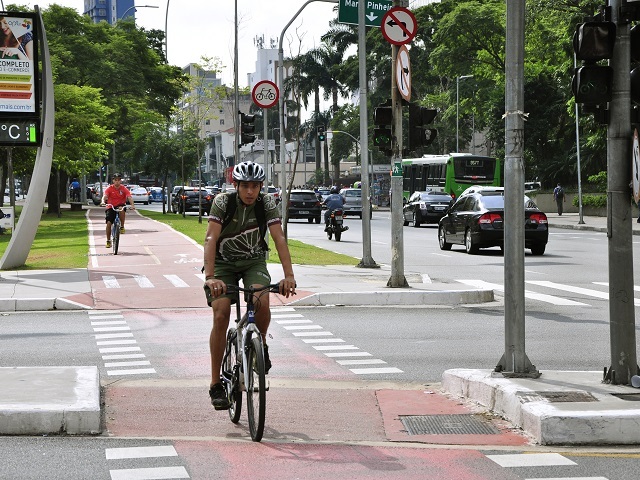 São Paulo, which already has a bikeshare program, increased its cycling network to 400 km (250 miles) of bike lanes, resulting in a 66 percent increase in bicyclists and a 34 percent reduction in deaths. Cities are identifying modes of transport that can move people safely and efficiently. 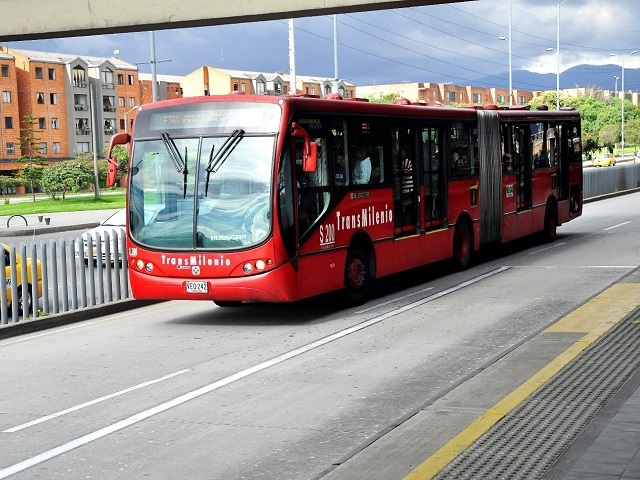 Bogotá, for example, has the Transmilenio Bus Rapid Transit (BRT), which carries 2.2 million passengers per day over 113 km (70.2 miles) of exclusive bus lanes. São Paulo and Shanghai are expanding their inventory of dedicated curbside bus lanes, which will improve the efficiency of their bus services. Ho Chi Minh City, known for moving people by motorcycle, is building metros and BRTs to offer safe methods for people to get around. Mumbai is planning to redesign a major bus terminal to improve pedestrian safety and access. Furthermore, Accra just launched a formal 21 km (13 mile) bus service to provide safer, more comfortable public transport. The last key theme revolved around how urban mobility interacts with both the public at large and people working within government. First, by improving intersections, calming traffic and allowing pedestrians to experience a safe road environment, all ten cities are beginning to change their road safety cultures. For example, Bogotá implemented 93 traffic calming interventions in 2016. “Through public space recovery, we are trying to show people how they can interact differently with public space and change the way they feel about it,” said Claudia Diaz Acosta, Advisor to the Bogotá Office of Mobility. Likewise, with support from NACTO, Addis Ababa has redesigned large intersections using chalk, cones, paint and other temporary materials, to reduce the exposure of pedestrians to fast moving traffic and show how spaces can be used differently.